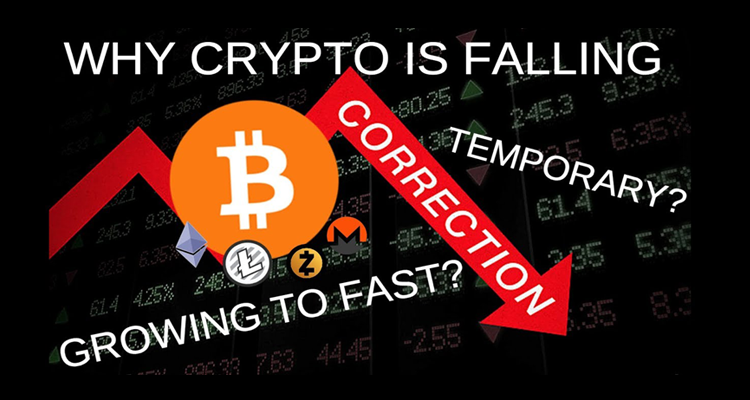 You are at:Home»News»Cryptocurrency Is Falling. Why? There is no doubt that panic has set in. The FUD has had wide repercussions. Bitcoin (BTC) has dropped to $3869 (it was approaching $5000 on September 4, 2017). Ethereum (ETH) is down to $270 (it was $308 on September 14, 2017). A tweet from Charlie Lee, the founder, and creator of Litecoin. (He has over 122,000 followers on his Twitter account). His tweet on September 12, 2017, caused widespread panic. He tweeted that China has banned Bitcoin Exchanges. (China had previously banned ICO’s). Now a ban on Bitcoin Exchanges in China? 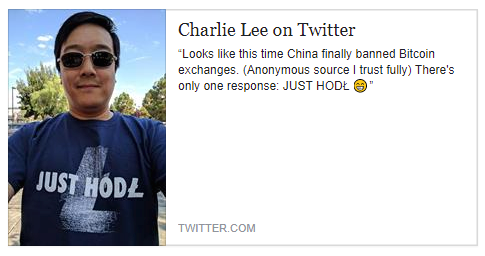 So with the official and confirmed ban of ICO’s in China and now this unconfirmed news that Charlie Lee says is from an anonymous source (that he fully trusts) that China has banned Bitcoin Exchanges as well, is one of the reasons why the Crypto Currency market has been in a state of panic and decline. (Thus, the power of social media to influence the Crypto-Currency Market). Do, I personally believe Mr. Lee? No sure. It appears to me there is an ulterior motive behind his tweet. I could be wrong, but my gut tells me not to panic. As of to date, the Chinese government has not banned cryptocurrency. The second reason is an article found in TechCrunch yesterday where JP Morgan Chase Chief Executive Jamie Dimon – a Wall Street Giant – said that Bitcoin is … “a fraud” and “worse than tulip bulbs.” My thinking is this: Banks don’t want “digital currency” to be a success because it is a threat to their existence. Digital currency is a “decentralized” entity and whereas banks – which are centralized – cannot they know that if digital currency takes off, they lose control of you and your money. If they lose control of you and your money, they do not make money. So, persons like Mr. Dimon are natural enemies of cryptocurrency and are hell-bent on sowing seeds of mistrust and confidence in cryptocurrency prompting investors in the market to panic. It only serves the interest of greedy bankers to criticize and have nothing good to say about cryptcurrency. They do not want cryptocurrency to thrive.These powerful people will do all they can to squash cryptocurrency. Again, I believe cryptocurrency is here to stay. It will always have its opposers. Those opposing are the “greedy ones” who have had their hands in our wallets and bank accounts since the beginning. They fear losing that control. I cannot tell you what to do. But as for me, I am holding on to my coins and will purchase more of the good ones in my portfolio while the market is in a dip.